I feel a bit guilty. I haven't posted in over a WEEK! And don't get me started on my reader - this weekend is for catching up on everyone's blog posts - I might not have the time to comment on all your posts, but be assured, I'm reading and I'll start commenting again when my reader falls below 1000 unread posts! But of course, wouldn't this face distract you? Rafe and I picked up a new puppy last weekend, and he is a handful -- and LOTs of fun. His name is Roscoe, and he is a Soft Coated Wheaten Terrier. We're in the midst of housebreaking, so he requires a LOT of attention for any signs that he needs to go out. And he LOVES to play....and snuggle, my personal favorite. In my haste to keep our apartment accident free, I haven't had a lot of time for photographing food (just puppy)- but I have been cooking. I thought this would be a good opportunity to review some great meals that can be prepared in a snap! Here is a list of some of my favorite quick recipes. I recommend them for when you're pressed for time, but don't want to spend money on takeout. And when all else fails, I throw together a quick omelet, frittata or box of Annie's with some veggies! 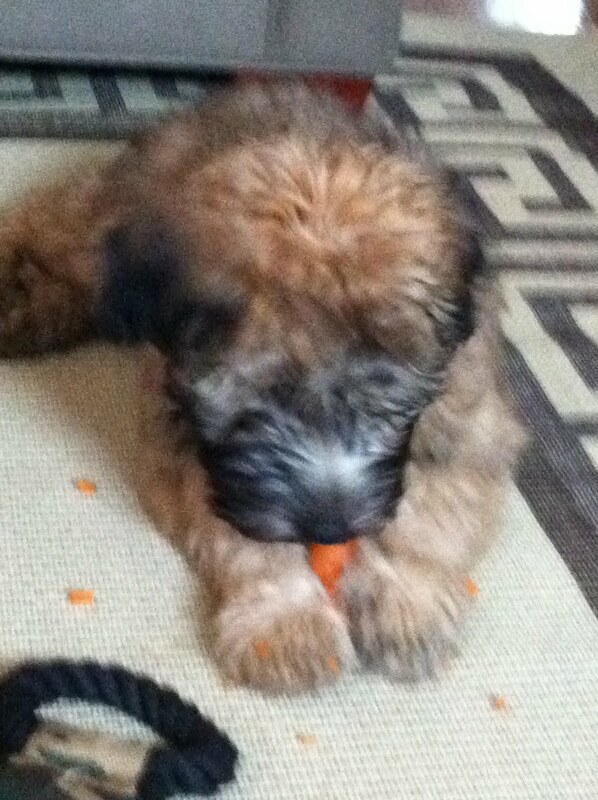 Roscoe likes carrots as a quick between-meal snack. What are some of your go-to quick recipes when you're pressed for time? oh my, roscoe is too cute ;) glad to hear you're having fun with him!! I am dying looking at pictures of Roscoe. There need to be more Roscoe photos on this blog and on Facebook! Oh my gosh! He's so cute! Enjoy him! He is so adorable! I wouldn't have time to cook with a puppy that cute around either! Wow, Roscoe is so cute! :) I've never seen a dog so fluffy!! !